The Fluke VR1710 Power Quality Recorder, is a single-phase, plug-in recorder that offers an extremely easy to use solution for recording and detecting power quality problems, allowing immediate remedial action and resulting in less downtime. The VR1710 satisfies the needs of maintenance and facilities management in industrial, utilities, and large service organizations where reliable power quality is essential to the operation of the business. 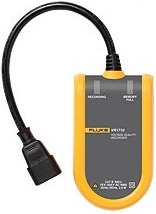 The Fluke VR1710 Voltage Quality Recorder (the Recorder) records and stores voltage trend data from a working power outlet. Once the logging parameters of the Recorder have been set via Power Log software, the Recorder collects data that can be downloaded to a Personal Computer (PC) for complete analysis. The advanced design ensures accurate recording of all voltage parameters. Fast and easy recording of voltage trends, drop outs, and power quality.